Turn any chilly evening into a cozy warm night by huddling around the Winsford fire pit set! With our exclusive 5” thick Ultra Plush Cushions and extra durable cup table, this piece comprises the perfect balance of beauty and functionality. 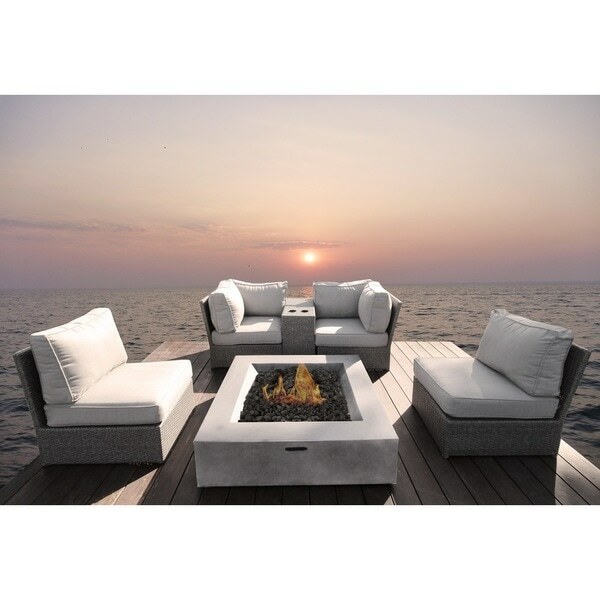 The Fire Pit table features a beautiful fire pit table, crafted from fiber reinforced concrete. This high end, resort grade furniture is made from durable strands of wicker incorporating a stunning assortment of a variety of shades. The Winsford collection is an ultimate showstopper that will enhance the look of any outdoor living space. Best of all, no assembly required. "How high is the seat bottom me with and without cusion"
"Will the fire pit operate off natural gas rather than propane?"